These first few days of Spring have without a doubt given us all a boost here at home. We’ve sorted through the clutter of winter and freshened up our tired looking living room. It’s been wonderful to watch the quality of light change as shadowy corners disappear and there are moments when sitting in the warm sun in the garden are almost within grasp. Almost. This week, I’ve had the pleasure of styling a brand new collection from Danish silversmiths Georg Jensen. With over 100 years of design history, the brand continues its signature style of simplistic, organic forms, collaborating with innovative designers who understand its Danish sensibilities. A modern statement – the Frequency vase. Handcrafted in striking stainless steel, the new Frequency collection is the result of a collaboration with world-renowned American designer Kelly Wearstler. Known for her exploration of colour, pattern and making vintage look contemporary, Kelly’s work is so distinctive that you recognise it instantly. This collection is different for its pared-back, minimal feel which fits so well in my home. I’ve chosen three of six pieces using foliage and blooms from my garden to illustrate their dramatic, sculptural presence. I think the collection beautifully combines Kelly’s contemporary Californian style with Georg Jensen’s Scandinavian heritage. Architectural stems of foliage can look just as striking as flowers. Inspired by her home on Malibu beach, the steel waves evoke a sense of fluidity, balance and energy. Each piece changes its appearance according to the nuances of the light. The undulating waves picking up the soft mid-morning sun in the bedroom, bouncing it back onto the walls. Living close to the river here, (though Medway is definitely not L.A!) I can understand why Kelly’s work is often informed by nature. Here, I’ve picked new shoots from a Sarah Bernhardt peony, whose deep red stems unfurl into vibrant green leaves. Aren’t they striking? Quietly luxurious, the Frequency Centrepiece sets the scene. Capturing the collection was no mean feat – the highly polished steel reflects back every surface, which I very much welcome in our dining room which, despite its south-facing aspect gets the least amount of light. I loved creating this ikebana arrangement with the Frequency Centrepiece, using select spring flowers and foliage from my garden. The contrast of the smooth surface of the bowl against the cracked plaster walls added texture to the scene. Its delicate, ribbon-like waves give the surface the appearance of floating. 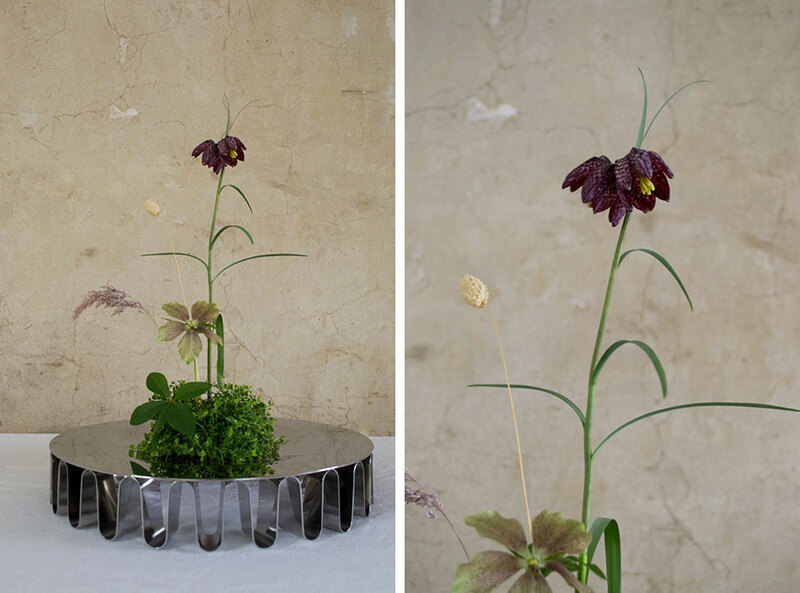 As a versatile design, the Centrepiece could also be used for fruit or to display treasures. There is an energy in the silhouettes, a vibrant movement that comes to life through the beautiful folds in the steel. Each design is like a sculptural conductor of this energy. A touch of Californian Mid-Summer style. The Frequency Hurriance in steel and glass. A little premature on my part, but these images speak of warmer days to come. There’s a small yard space opposite my kitchen with a little deck made from reclaimed railway sleepers. After 4pm it becomes a real sun trap and you’ll often find me here within shouting distance of the back door. 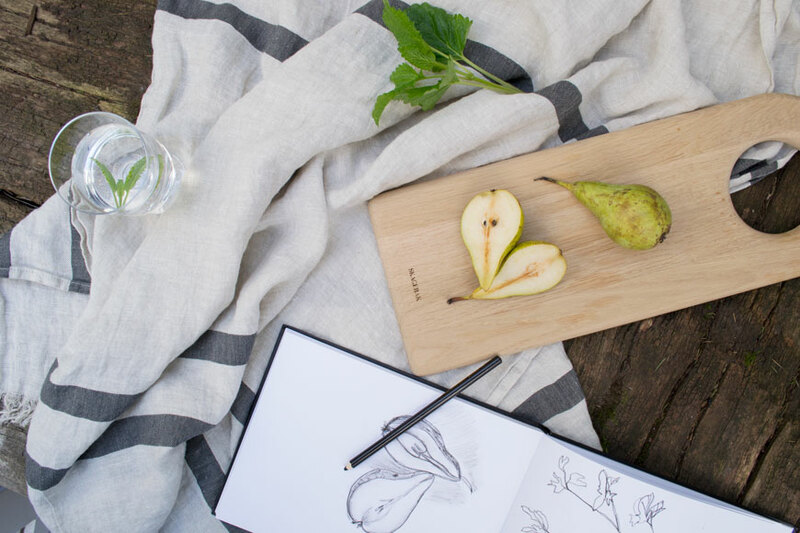 A linen towel doubles up as a picnic blanket and there’s time to sit and watch the evening to draw in, Hurricane lantern lit and something cool to drink in hand. It’s not quite California, but it’ll do. The Frequency Collection is available instore and online at http://www.georgjensen.com. Photography and Styling © Tiffany Grant-Riley.